A chic and modern hotel in a historic 1860s listed building, the Hilton Edinburgh Grosvenor hotel is housed over two buildings, a main building and a townhouse building. Situated in the stylish West End of the city, this hotel offers easy access to the train station and popular local attractions. Each room is equipped with a flat-screen TB and modern designs. Enjoy contemporary Scottish cuisine at The Townhouse Restaurant and sip on your favorite cocktails at Bar 521. 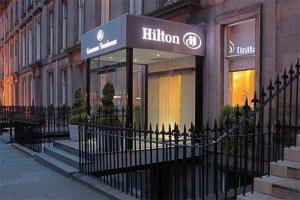 Located a short walk from Princes Street and Edinburgh Castle, and 7 miles from Edinburgh Airport.